5 Ayurvedic Skin Balancing Tips For The Cold and Dry Autumn Weather…..
A healthy skin care regimen that changes with the seasons will offset seasonal imbalances caused by exposure to the elements. Ayurveda tells us that the vata dosha—characterized by air and space—dominates during the autumn season, which explains why so many people experience dull, dry, itchy, and even irritated skin. Lucky for you, there’s no need to adopt some intricate skin care regimen that takes too much time and money to put into place. In fact, a little more awareness and a few simple strategies are all that you need to bring balance back to your skin. 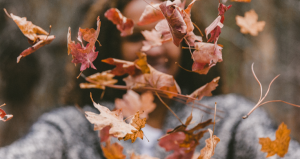 Here are five things to focus on this autumn and winter to help you combat the skin-drying effects of vata. It’s important to know that healthy skin starts from the inside. Staying hydrated will not only help your mind and entire body—but your skin, too. Drink beverages that are warm (like herbal teas) and avoid anything refrigerated or ice-cold, which has a tendency to aggravate vata. If you’re going to drink a glass of water, make it no colder than room temperature. And don’t forget, hydrating foods count too! Think hearty soups, stews, chillies, slow cooker meals and other dishes that contain lots of veggies, broth, sauce, and overall nutrient-dense moisture. Now is the time to embrace foods naturally high in healthy fats in your diet and all your autumn cooking. Just like good hydration, healthy fats work from inside out, helping to keep your skin moisturized, healthy, and glowing. Aim to eat more foods like oily fish (such as wild salmon), nuts and seeds, avocados, and ghee. And make sure to cook regularly with healthy oils like olive oil, sesame oil, or coconut oil. Ayurveda recommends starting your day off with a full-body massage using organic sesame oil to help bring warmth to the body while improving circulation. This will help improve your skin’s soft and moisturization levels while keeping your body feeling warm all day. Sesame oil has powerful antioxidant properties that can penetrate the layers of the skin fast and enter the bloodstream. It also has antibacterial and anti-inflammatory properties as an added bonus to help protect your skin from the harsh elements during the colder seasons. You may be tempted to massage yourself with sesame oil after showering or bathing, but Ayurveda advises us all to do so beforehand. The steam will help to preserve moisture throughout the deeper layers your skin. Rub your hands in a slow, circular motion starting from the bottom of your feet moving upwards. Let it soak into your skin for about 15 minutes before stepping into the shower or bath and avoid scrubbing the skin too vigorously (or at all) so as to allow a thin coating of oil to remain on your skin throughout the day. Go for a lotion made with natural ingredients and a nourishing oil base like avocado, jojoba, sesame, olive, almond, or coconut. Shea butter (organic and unrefined) is also a good choice for its naturally soothing and moisturizing properties.